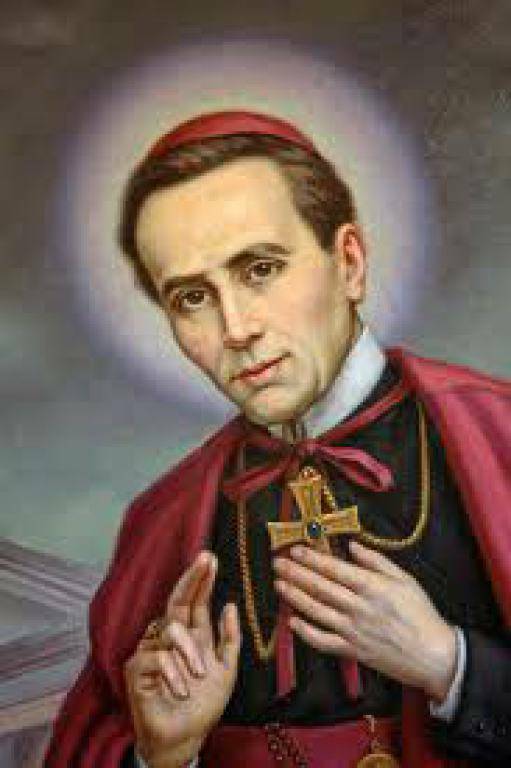 Who was Saint John Neumann? Saint John Neumann was Bishop of Philadelphia, a leader in Catholic Education and a spirited defender of the poor. In 2012 a member of an order he founded will be canonized by Pope Benedict XVI. March 28, 1811 – Born in Prachatitz, Bohemia & Baptized on the same day. 1836 - Sails for America. Ordained a priest on June 25, 1836, for the Diocese of New York. He is assigned to the “Niagara Area” of upstate New York; arrives in Buffalo on July 12, 1836. January 16, 1842, John Neumann becomes the first Redemptorist to profess vows in the U.S.A. His first assignment is in Baltimore, MD; then on to Pittsburgh, PA.
March 15, 1847 - Fr. Neumann is appointed “General Superior” of American Redemptorists. February 10, 1848 – John Neumann becomes an American citizen. March 28, 1852 - (41st Birthday) Rev. John Neumann was consecrated the 4th Bishop of Philadelphia. Established the Diocesan School System and a Diocesan Schedule for 40 Hours Devotion. Built many schools and churches. December 8, 1854 – Bishop Neumann was in attendance for Pope Pius IX’s proclamation of the Dogma of the Immaculate Conception. Upon the recommendation of the Pope, Bishop Neumann established the Third Order of Sisters of St. Francis. January 5, 1860 – Bishop Neumann dies while running errands. 1921 – Declared “Heroic in Virtue” (Pope Benedict XV). 1963 – Declared “Blessed” (Pope Paul VI). 1977 – Canonized a Saint (Pope Paul VI). Our patron was born on March 28, 1811 in the village of Prachalitz in Bohemia (now the Czech Republic) and taken the same day to the parish church, baptized and named John Nepomucene for one of the patron saints of his homeland. Following his graduation from a nearby college in Bohemia, he applied to the seminary. John distinguished himself not only in his theological studies, but also in the natural sciences. Besides mastering Latin, Greek and Hebrew, he learned to speak fluently at least eight modern languages. While in seminary, John felt called to be a missionary in America. Tens of thousands of German Catholics had immigrated to the United States and there was an urgent need for German-speaking priests. A few days after arriving in New York, he met the bishop, John Dubois. Bishop Dubois had only 36 priests to care for 200,000 Catholics living in all of New York State and half of lower New Jersey. In June of 1836, the bishop ordained John Neumann as a sub-deacon, a deacon, and as a priest, all within one week’s time. The following week he was pastor of the whole Niagara Frontier, some one hundred square miles of swampy primeval forest. Father John Neumann devoted himself to the pastoral care of all the outlying areas in his parish for four years. From his headquarters near Buffalo, he made frequent journeys on foot to visit the settlers on their farms. He built churches, raised log schools and even taught school to the German and Irish children in the area. Father Neumann’s strenuous work and pace soon took a toll and his health began to suffer. He decided to join the Redemptorists Missionary Order and was the first person to make his religious profession as a Redemptorist in America in 1842 at the Church of St. James in Baltimore. Before his elevation to Bishop of Philadelphia at the age of 41, he served as rector of St. Philomena Church in Pittsburgh, and St. Alphonsus Church in Baltimore, as well as vice-provincial of the Redemptorists Missionary Order in America. He was consecrated Bishop of Philadelphia by Archbishop Francis Kenrick at St. Alphonsus Church in Baltimore in 1852. At that time, the Diocese of Philadelphia was the largest Diocese in America, comprising eastern Pennsylvania, western New Jersey, and all of Delaware. He actively promoted the establishment of parochial schools and increased the number of schools in his Diocese from two schools in 1852, to nearly one hundred by 1860. Through his work with parochial schools, he helped the Notre Dame Sisters of Munich become firmly established in the United States. Though Bishop Neumann had suffered from frequent illnesses, his sudden death by stroke on January 5, 1860 at the age of 48, was completely unexpected. The cause of his beatification began in 1886. Ten years later, he received the title of Venerable. In February, 1963, Pope John XXIII issued the proclamation for his Beatification, but the ceremony was delayed by the death of Pope John. Pope Paul VI beatified him on October 13, 1963. His Canonization followed in June of 1977, becoming the first man from the United States to become a saint in the Roman Catholic Church.